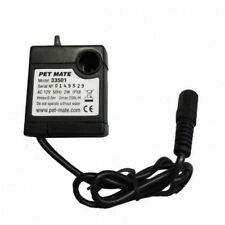 12v pet fountain pump for use with the Pet Mate Drinking Fountain Code 335. As such, we have a huge wealth of experience in online trading. At present we list nearly 5,000 specialist aquarium & pet products suitable for Aquatic, Reptile, Cat and Dog enthusiasts. Once your order has been placed it is processed by our highly skilled and dedicated warehouse team. WHEN WILL MY ORDER ARRIVE?. For use with Dog Mate and Cat Mate Pet Fountains. 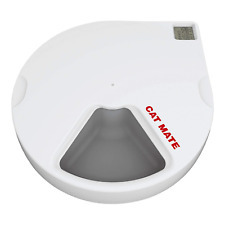 Cat Mate C500 Automatic Pet Feeder With Digital Timer For Cats And Small Dogs. Condition is New. Dispatched with eBay delivery – Shutl 2-3 days. Pet feeder. New. Has ice pack for freshness. Please review the pictures and feel free to ask questions. Color - light blue. Would buy from again! We are Proud With Our Service. Date: 20/02/2014. Date: 23/02/2014. Item Image. For use with Dog Mate and Cat Mate Pet Fountains. 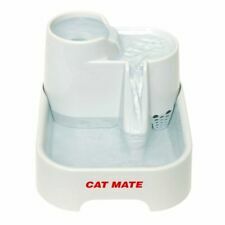 All Cat Mate and Dog Mate feeders, fountains and product accessories are manufactured from food grade, BPA free plastics. Never run your fountain without a filter fitted. Here you will find a full review with all the information you need to decide if this automatic feeder is suitable for your needs. Capability to dispense cycles up to 48 hours. 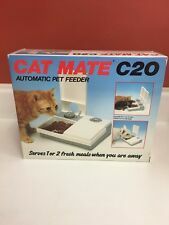 CAT MATE C20. 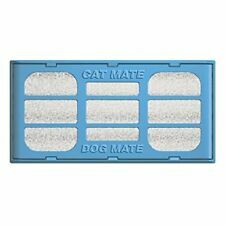 What are the Pros and Cons of the Cat Mate C20?. Requires 3 x AA batteries (not included) which will give over 12 months operation. The Cat Mate C500 has an easy to clean, dishwasher-proof lid and bowl. Designed to be tamper resistant to pets, the C500 may be easily fastened to a wooden board for extra stability, if required. If you’re going away for the weekend but are struggling to find anyone to nip in and feed your cat, then this Cat Mate Automatic Feeder C500 could be the ideal solution for you. The automatic feeder is battery-operated (3 x AA batteries not included). If you’re going away for the weekend but are struggling to find anyone to nip in and feed your cat, then this Cat Mate Automatic Feeder C500 could be the ideal solution for you. For easy, quick and thorough cleaning, the top of the automatic feeder can be removed, as can the bowls. Feeder may be easily attached to a removable wooden board for stability. Pet Type Cat, Dog. We go above and beyond to ensure you receive the best level of service. Quantity 1. Colour Assorted. Inner Material Lining. Pet Supplies. Replace monthly to maintain clear fresh drinking water for your pet. Your pets will love the clean, fresh flowing water the Cat Mate Shell Fountain provides. The Cat Mate Shell Fountain is exceptionally quiet in operation and maximises the appeal of drinking with its multi-height drinking levels. For use with Dog Mate and Cat Mate Pet Fountains. Need your item quicker?. We would love to be given the opportunity to work with you to resolve any problem you may have. Feeder may be easily attached to a removable wooden board for stability. BEST PRICING. We do our best to process as quickly as possible. Box Contains. Cancel Order. Feeder may be easily attached to a removable wooden board for stability. We take our reputation seriously. Easy-clean, removable, dishwasher-proof lids and bowls. Feeder may be easily attached to a removable wooden board for stability. Orders will be fulfilled by our own warehouse or a 3rd party supplier at our discretion.